Jackie Oates | The Goose Is Out! Well, we originally booked Jackie back in the day when the Goose was scarcely out of its egg (well, 2008. Seems like a long time ago!) because we thought we’d better have a change from all the BlokeFolk (technical term – copyright us) we’d had up till then. Jackie had fast been establishing a reputation as a fiddle-singer (singing and playing the fiddle at the same time) and when she first came to the Goose she had just finished recording her second album. 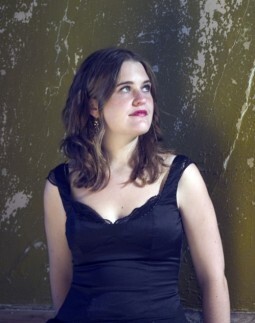 It was a lovely evening, and since then we have watched her blossoming in her solo career since leaving The Unthanks, and we were absolutely delighted to have the opportunity to have her back, first with her own band and then as a duo with excellent young guitarist Tristan Seume! Jackie was accompanied on her second visit by Mike Cosgrave on accordion and keyboards, Tristan Seume on guitar and James Budden on double bass, so if you like her album Hyperboreans as much as we do, you hopefully enjoyed getting the full effect that night! Every time Jackie has been to the Goose, it has been a real pleasure to hear such beautiful singing and playing. Thanks, Jackie! Oh, and she has somehow since we first met her managed to find time to have two beautiful children!! 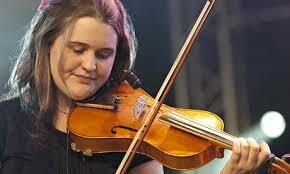 Jackie Oates is a singer and fiddle player hailing from Staffordshire. Her unique treatment of English ballads and songs, and pure, haunting singing style, has established her at the forefront of the new English folk revival. Lullabies was released in 2013. Click here to go to Jackie Oates’ website! Click here to go to Tristan Seume’s website!